McGill University is facing growing pressure to change the Redmen name of its male varsity sports teams, which has been used for nearly a century. While the precise origin of the nickname is uncertain, McGill historians believe it originated in the 1920s as a reference to the school’s red-and-white jersey colours and possibly the Scottish heritage of its founder. However, the name’s racist connotations have been frequently evoked over the years, including periods when athletic teams were called the Indians and the Squaws. As recently as the early 1990s, the teams’ official logo and mascot was a stereotypical Indigenous “chief” profile. “I found that the name was unacceptable as soon as I got to campus,” Tomas Jirousek told the Nation. The third-year student and rowing team member is from the Kainai First Nation in southern Alberta and grew up in Whitehorse, Yukon. Instead of leaving the rowing team or transferring to another institution, Jirousek has chosen to organize a protest over the continuing use of the Redmen name. In doing so, he hopes that future Indigenous students don’t face a similar internal struggle of reconciling their cultural pride with studying at Canada’s most prestigious school. “I didn’t think it was fair that I, with my ability to speak to the issues both as an athlete and Indigenous student and being heavily involved in the politics at the university, ignore the problem,” said Jirousek who, among other roles, is Students’ Society of McGill University (SSMU) Indigenous Affairs Commissioner. Ned Blackhawk, now a professor at Yale University, recalls confronting this problem as a McGill student in the early 1990s. While he faced discomfort every day practicing for the track team under the visage of an “angry Indian” at the stadium, he wasn’t moved to act until the 1990 Oka Crisis. After publishing an op-ed in the McGill Daily and orchestrating political campaigns alongside fellow students, the offensive mascot was finally abolished. Blackhawk is also credited as being an early advocate for creating an Indigenous Studies program, which was finally launched at McGill in 2015. For an institution that positions itself as inclusive, McGill’s much work remains for the school’s decolonization efforts. A man who allegedly owned Indigenous slaves founded the university on unceded Haudenosaunee land. Some recent Indigenous students have reported feeling isolated and unwelcome. Jirousek remembers numerous Elders and friends warning him to avoid McGill because of its history and interactions with Indigenous people. In response to Canada’s Truth and Reconciliation Commission’s calls to action, the university’s task force released a report last year about improving its relations with Indigenous students. Changing the Redmen name was recommended as an “immediate” action. In mid-October, Provost Christopher Manfredi responded to the “frustration and impatience” of community members who want a name change, stressing the significance of any renaming decision and the necessity for thorough community consultation. Manfredi wrote that the decision would be guided by principles developed by a working group, which is to submit its final report in December. While other McGill athletes and Montreal Gazette columnist Martin Patriquin maintain that the name is a harmless reference to school colours, several high schools across the country have already changed their Redmen names. The SSMU Legislative Council overwhelmingly approved a renaming motion in early October and a petition on change.org had over 8,300 signatures at press time. 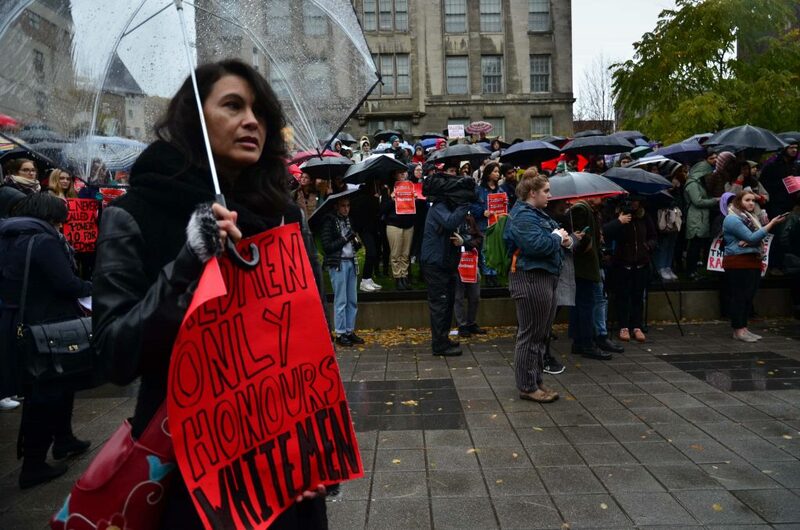 “We can be principled when we conclude that past stereotypes are indeed weighty things in the here and now, and that the burden is no longer solely for Indigenous students to carry,” wrote Christa Scholtz, Associate Professor and Chair of McGill’s Indigenous Studies program, in response to Patriquin’s column. Despite some snide comments from varsity players, Jirousek is encouraged by the “overwhelming support” he has received from his rowing team, the student union and much of the community. To those suggesting he is unreasonably preoccupied with the name, he points to the diversity of groups joining the movement and offers a question of his own for opponents. Jirousek invites those on both sides of the issue to the demonstration as well as town hall events in early November when a non-binding student vote regarding renaming will take place. He hopes that presenting Indigenous perspectives can change many minds on campus. “This is an opportunity for the entire McGill student body to demonstrate that it stands in solidarity and it respects the opinions and the experiences of Indigenous people,” said Jirousek. The name’s racist connotations have been frequently evoked over the years, including periods when athletic teams were called the Indians and the Squaws.